Our group consisted of 5 to-be Electronics Engineers and 2 full Engineers, so total group of 7. The destination being Igatpuri (इगतपुरी), we were equipped with sweater, blankets, monkey-cap, mufflers etc and were ready to spend the night at Igatpuri ST stand with the mercury level falling below 10 °C. Our train journey mainly consisted of making fun of our college professors, how our external examiner looked funnier than any existing cartoon, discussion on how 'awesome' our college facilities were.... and most of the time- एक दुसरेकी टांग खिचना.... The discussion on IMS management classes-marketing strategy lasted for quite some time !! We reached Igatpuri station at 3:10 AM, and the moment we got down the from the train, we got the feel of the cold night we were about spend there. At the ST stand, Abhash and TSEC Tarun were off to sleep- डोक्यावर कानटोपी अन अंगावर चादर, अगदी गावठी style माध्ये !! Meanwhile Manoj and Aaditya found a small piece of half-burnt wood and brought it inside the bus stand, and made a शेकोटी out of it. To keep the fire burning, we used the posters of local politician as the fuel and at the same time, Aaditya made sure that each and every poster was removed from the wall !! At around 4:30 AM, one by one, we all went to sleep and had a quick nap of an hour and a half. SAKEC Tarun didn't have any intentions of sleeping (ट्रेन मे बोहोत सोया था) so he was keeping a vigil- may be it suits his aspiration for joining Indian Army !! The first ST bus was scheduled at 8.45 AM (2013, timings might change). The next bus was at 2.00 PM. The awesome village roads, full of twists and turns surrounding the Vaitarna lake would be definitely worth mentioning. The traditional rural cattle smell, the hay-stacks, small farms, bore-well was the common yet pleasant sight to look at rather than the everyday concrete buildings and busy roads in the city. 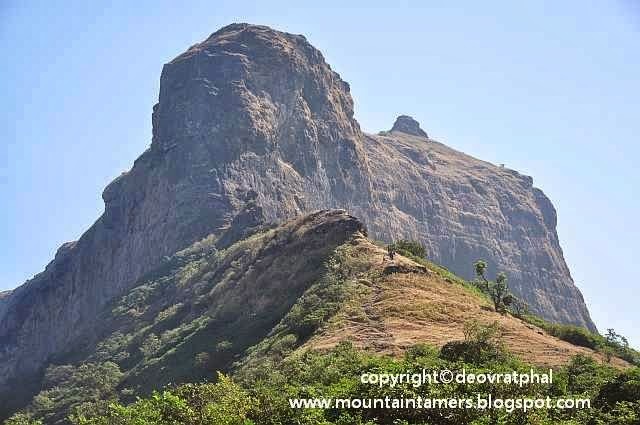 On the way we come across helluva Sahyadri mountains lying in the Igatpuri region, prominent being- Anjaneri, Trimbakeshwar, Bhasgad, Tringalwadi, Fani Dongar, Alang-Kulang-Madan far far away and Harihar of course. The ST bus reached Nirgudpada at 10:25 AM. We packed our sweaters-mufflers etc, tightened our shoe lace and started the trek at 10:30 AM. 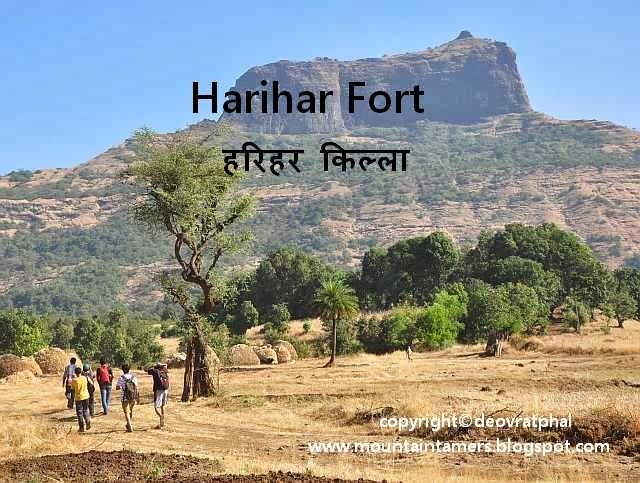 If you arrive from Khodala or Igatpuri, Harihar would be on the left-hand side. Just where the bus stops, take any route going towards the fort. 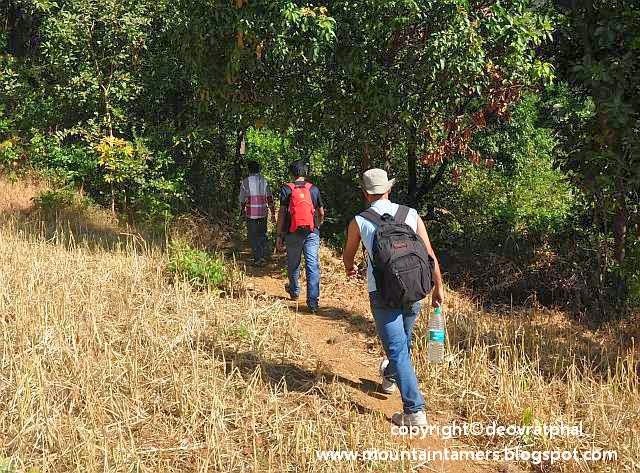 It is confusing to find the correct trail out of many complex-intermixing trails, but focus on the trails which climbs towards the plateau on the left side of the fort. From the plateau, the ridge takes you to the start of another gradient and later to the rock-cut steps. After that the route to the top was straightforward, but a bit exposed to valley. Take extra care while crossing this section. Here are a few snaps of overall journey. Aloo parathas (आलू पराठा), Theplas, Puri bhaji (पुरी भाजी), Shira (शीरा) consisted of our lunch. Our lunchboxes were empty within 15 minutes they were opened. It was worth noting how the items were gobbled- given the tough climbing conditions. Reached the base at 3.10 PM. Clicked a lot of pics on the way. Here are some of them.. The video below shows a part of the descend. In the evening there are two ST buses- ST to Kasara and ST to Igatpuri (both at approx. 3.30 PM ) from Nirgudpada. If not the bus, Jeeps usually ply on the Ghoti-Vaitarna road from Trimbak, and can drop you at khodala. At 3.20 PM we left Nirgudpada 'on' a Mahindra MaXX (yes, we were literally sitting on the carrier) which dropped us at khodala and from Khodala, another MaXX till Kasara railway station. One can also catch a ST bus from Khodala to Kasara, but since we didn't know the timing we preferred a jeep. The total passengers travelling on the jeep were 22 + 1 driver (front 3, 5 on middle seat, 3 hanging outside on the left side, 3 hanging outside on the back side and 8 people sitting on the back seat). Khodala to Kasara is 25 Kms. After some 17 Km ride, the small dirt road joined the Mumbai-Nashik Expressway- but on the wrong side of the road!! We were in a vehicle, which was driving on the right hand side of the busy AH47, with other vehicles speeding towards us from the front. After the 2-3 Km of this circus we joined the 'our side of the road'. We reached Kasara station at 5.00 PM roughly and boarded the local train to Kalyan (which was the only option before us). From Kalyan, caught another local to Mumbai CST and by 10.15 - 10.20 PM everyone was at home. Here's the link to the Marathi version written by Aaditya Gurav. Its a book in pdf format. Click here to download the book. 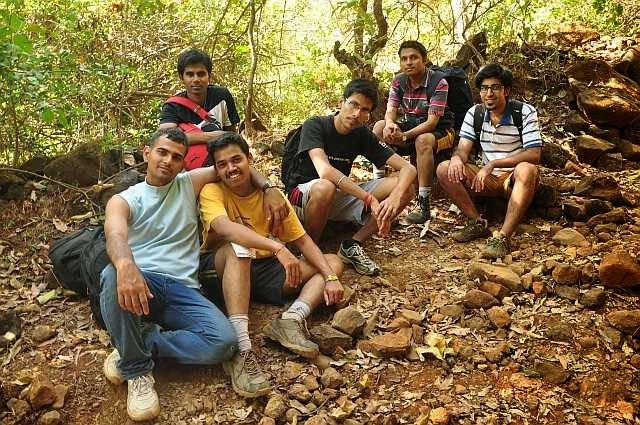 Abhash kumar, Manoj Patil, Ninad Vilankar, Aaditya Gurav, Tarun (Gangwani & Kaushik) and me.